Oregon’s linebackers have continued to demonstrate that the Ducks are just as physical as the next team: lean, mean, hard hitting terminators that pace just beyond the defensive line, chasing after the ball like a gang of wild pit-bulls. But one recent Oregon commit for the 2015 class, Steilcoom high school’s Fotu Leiato II, may change the definition of what it means to be a Duck linebacker. Throughout the 2014 season, Duck fans saw powerful performances from linebackers Joe Walker, Tony Washington Jr., Christian French, Rodney Hardrick, Tyson Coleman, Torrodney Prevot and Danny Mattingly. However, it is the angry, concussive power of Leiato that brings a different, spirited spark to Oregon’s defense. Don’t let his size fool you. While relatively small for a linebacker at 6 foot flat and 200 pounds, the beast of Steilacoom, Washington, Leiato is a heat-seeking missile, scorching the earth and laying waste to anyone n his war path. At the beginning of his senior season, Leiato was a zero-star recruit, mowing lawns to get the financial resources necessary to attend camps that provide exposure to relatively unknown players, according to The News Tribune. Leiato was determined to create his own hype and released a hard-hitting senior highlight reel on Hudl. The video exploded, reaching roughly half a million views and securing him the opportunity to play at Oregon. In the video, Leiato delivers hit after devastating hit that few can withstand while remaining upright. In fact, most of the “victims” in Leiato’s senior highlight reel fly out of the screen or curl into a fetal ball after taking a spoonful of his bitter medicine. Leiato finished his senior year with 91 tackles and 4.5 sacks. “I just go out there 100 percent, full speed. Whoever gets the ball, I try to get them. Sometimes I’m like, ‘ Ohh, I just did that. I just hit that guy,'” Leiato told the Tribune. Leiato fits the Kiko Alonso-type mold that Oregon’s outside linebacker coach Erik Chinander and defensive coordinator Don Pellum continue to recruit: fast and aggressive, with an ability to infiltrate the line in blitz packages or drop back for open-field “hunting” assignments. Leiato joins JUCO transfer from Georgia, linebacker Paris Bostick, who signed after the Ducks’ commanding defensive display in the Rose Bowl. Coleman, Walker, Hardrick, French, and Mattingly, are all expected to return next season for the Ducks, a group that has championship level experience to share with Oregon’s newest additions. 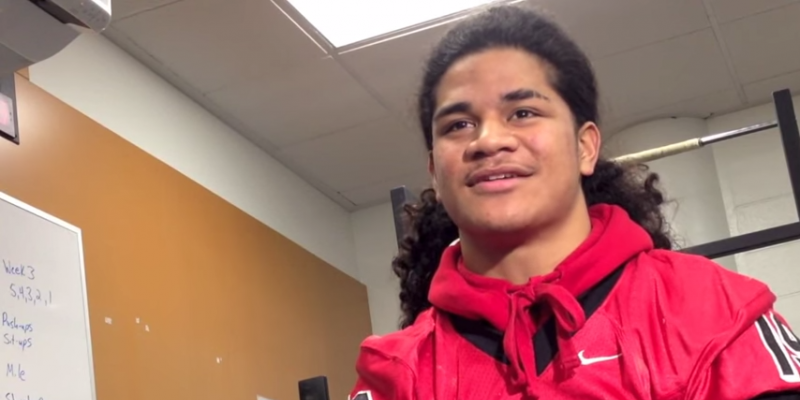 For recruits like Leiato, well, they have something to share as well. And it ain’t gonna be pretty.